Scientists from NASA and three universities have presented new discoveries about the way heat and energy move and manifest in the ionosphere, a region of Earth’s atmosphere that reacts to changes from both space above and Earth below. Far above Earth’s surface, within the tenuous upper atmosphere, is a sea of particles that have been split into positive and negative ions by the Sun’s harsh ultraviolet radiation. Called the ionosphere, this is Earth’s interface to space, the area where Earth’s neutral atmosphere and terrestrial weather give way to the space environment that dominates most of the rest of the universe – an environment that hosts charged particles and a complex system of electric and magnetic fields. The ionosphere is both shaped by waves from the atmosphere below and uniquely responsive to the changing conditions in space, conveying such space weather into observable, Earth-effective phenomena creating the aurora, disrupting communications signals, and sometimes causing satellite problems. Many of these effects are not well-understood, leaving the ionosphere, for the most part, a region of mystery. Scientists from NASA’s Goddard Space Flight Center in Greenbelt, Maryland, the Catholic University of America in Washington, D.C., the University of Colorado Boulder, and the University of California, Berkeley, presented new results on the ionosphere at the fall meeting of the American Geophysical Union on Dec. 14, 2016, in San Francisco. One researcher explained how the interaction between the ionosphere and another layer in the atmosphere, the thermosphere, counteract heating in the thermosphere – heating that leads to expansion of the upper atmosphere, which can cause premature orbital decay. Another researcher described how energy outside the ionosphere accumulates until it discharges – not unlike lightning – offering an explanation for how energy from space weather crosses over into the ionosphere. A third scientist discussed two upcoming NASA missions that will provide key observations of this region, helping us better understand how the ionosphere reacts both to space weather and to terrestrial weather. Changes in the ionosphere are primarily driven by the Sun’s activity. Though it may appear unchanging to us on the ground, our Sun is, in fact, a very dynamic, active star. Watching the Sun in ultraviolet wavelengths of light from space – above our UV light-blocking atmosphere – reveals constant activity, including bursts of light, particles, and magnetic fields. Occasionally, the Sun releases huge clouds of particles and magnetic fields that explode out from the Sun at more than a million miles per hour. These are called coronal mass ejections, or CMEs. 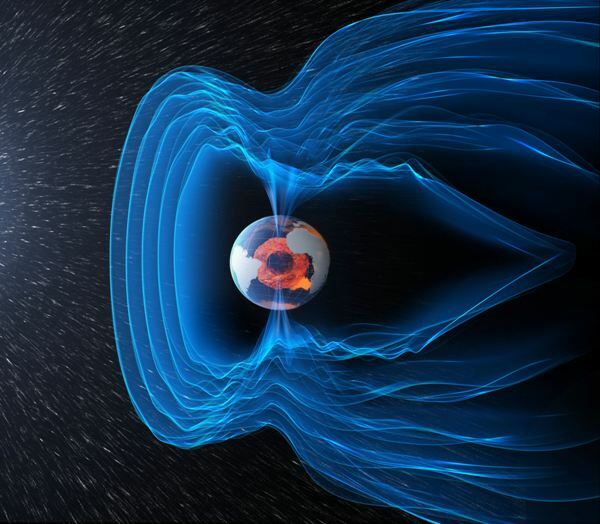 When a CME reaches Earth, its embedded magnetic fields can interact with Earth’s natural magnetic field – called the magnetosphere – sometimes compressing it or even causing parts of it to realign. It is this realignment that transfers energy into Earth’s atmospheric system, by setting off a chain reaction of shifting electric and magnetic fields that can send the particles already trapped near Earth skittering in all directions. These particles can then create one of the most recognizable and awe-inspiring space weather events – the aurora, otherwise known as the Northern Lights. But the transfer of energy into the atmosphere isn’t always so innocuous. It can also heat the upper atmosphere – where low-Earth satellites orbit – causing it to expand like a hot-air balloon. This phenomenon is called satellite drag. New research shows that this understanding of the upper atmosphere’s response to solar storms – and the resulting satellite drag – may not always hold true. Sometimes, the energy from solar storms can trigger a chemical reaction that produces a compound called nitric oxide in the upper atmosphere. Nitric oxide acts as a cooling agent at very high altitudes, promoting energy loss to space, so a significant increase in this compound can cause a phenomenon called overcooling. 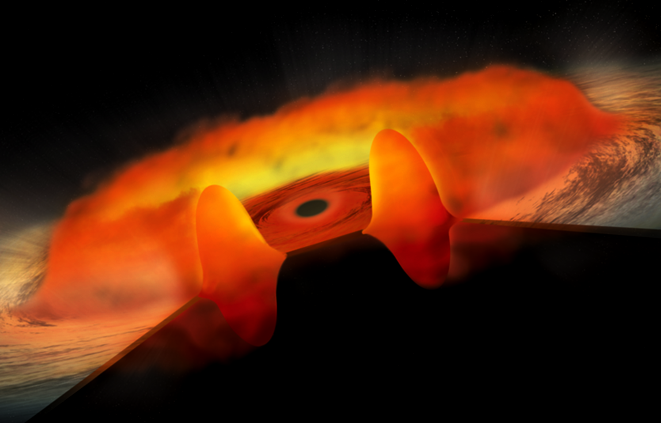 That quick loss of energy counteracts the previous expansion, causing the upper atmosphere to collapse back down – sometimes to an even smaller state than it started in, leaving satellites traveling through lower-density regions than anticipated. A new analysis by Knipp and her team classifies the types of storms that are likely to lead to this overcooling and rapid upper atmosphere collapse. By comparing over a decade of measurements from Department of Defense satellites and NASA’s Thermosphere, Ionosphere, Mesosphere Energetics and Dynamics, or TIMED, mission, the researchers were able to spot patterns in energy moving throughout the upper atmosphere. This means that, counterintuitively, the most energetic solar storms are likely to provide a net cooling and shrinking effect on the upper atmosphere, rather than heating and expanding it as had been previously understood. Competing with this cooling process is the heating that caused by solar storm energy making its way into Earth’s atmosphere. Though scientists have known that solar wind energy eventually reaches the ionosphere, they have understood little about where, when and how this transfer takes place. New observations show that the process is localized and impulsive, and partly dependent on the state of the ionosphere itself. 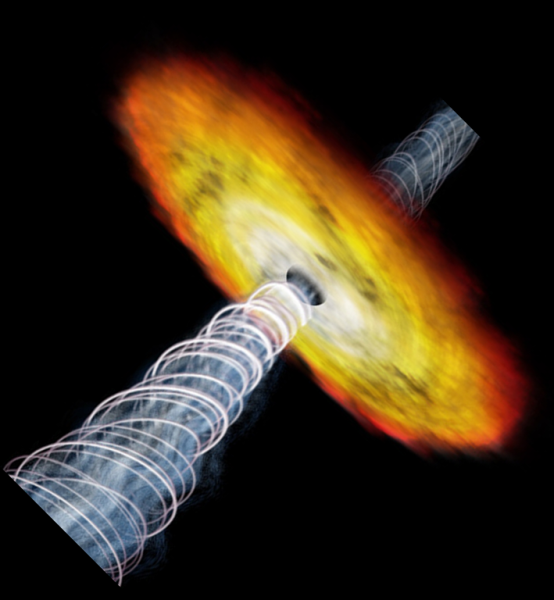 Traditionally, scientists have thought that the way energy moves throughout Earth’s magnetosphere and atmosphere is determined by the characteristics of the incoming particles and magnetic fields of the solar wind – for instance, a long, steady stream of solar particles would produce different effects than a faster, less consistent stream. However, new data shows that the way energy moves is much more closely tied to the mechanisms by which the magnetosphere and ionosphere are linked. “The energy transfer process turns out to be very similar to the way lightning forms during a thunderstorm,” said Bob Robinson, a space scientist at NASA Goddard and the Catholic University of America. During a thunderstorm, a buildup of electric potential difference – called voltage – between a cloud and the ground leads to a sudden, violent discharge of that electric energy in the form of lightning. This discharge can only happen if there’s an electrically conducting pathway between the cloud and the ground, called a leader. Similarly, the solar wind striking the magnetosphere can build up a voltage difference between different regions of the ionosphere and the magnetosphere. 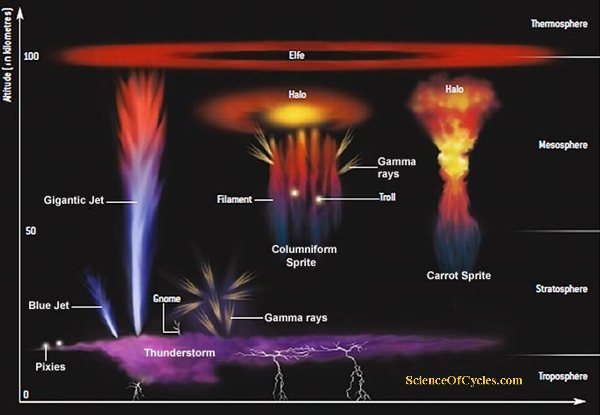 Electric currents can form between these regions, creating the conducting pathway needed for that built-up electric energy to discharge into the ionosphere as a kind of lightning. “Terrestrial lightning takes several milliseconds to occur, while this magnetosphere-ionosphere ‘lightning’ lasts for several hours – and the amount of energy transferred is hundreds to thousands of times greater,” said Robinson, lead researcher on these new results. These results are based on data from the global Iridium satellite communications constellation. 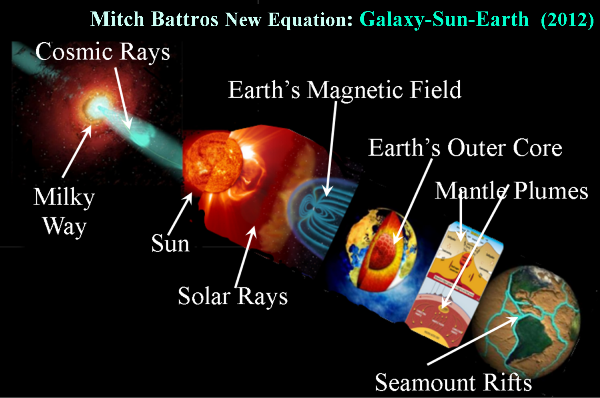 Because solar storms enhance the electric currents that let this magnetosphere-ionosphere lightning take place, this type of energy transfer is much more likely when Earth’s magnetic field is jostled by a solar event. The huge energy transfer from this magnetosphere-ionosphere lightning is associated with heating of the ionosphere and upper atmosphere, as well as increased aurora. Though scientists are making progress in understanding the key processes that drive changes in the ionosphere and, in turn, on Earth, there is still much to be understood. In 2017, NASA is launching two missions to investigate this dynamic region: the Ionospheric Connection Explorer, or ICON, and Global Observations of the Limb and Disk, or GOLD. ICON will simultaneously measure the characteristics of charged particles in the ionosphere and neutral particles in the atmosphere – including those shaped by terrestrial weather – to understand how they interact. GOLD will take many of the same measurements, but from geostationary orbit, which gives a global view of how the ionosphere changes. 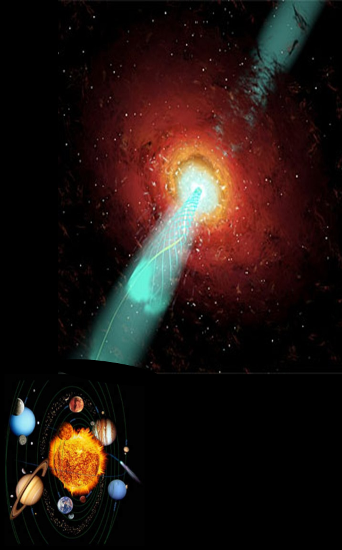 Both ICON and GOLD will take advantage of a phenomenon called airglow – the light emitted by gas that is excited or ionized by solar radiation – to study the ionosphere. By measuring the light from airglow, scientists can track the changing composition, density, and even temperature of particles in the ionosphere and neutral atmosphere. ICON’s position 350 miles above Earth will enable it to study the atmosphere in profile, giving scientists an unprecedented look at the state of the ionosphere at a range of altitudes. Meanwhile, GOLD’s position 22,000 miles above Earth will give it the chance to track changes in the ionosphere as they move across the globe, similar to how a weather satellite tracks a storm. “We will be using these two missions together to understand how dynamic weather systems are reflected in the upper atmosphere, and how these changes impact the ionosphere,” said England. 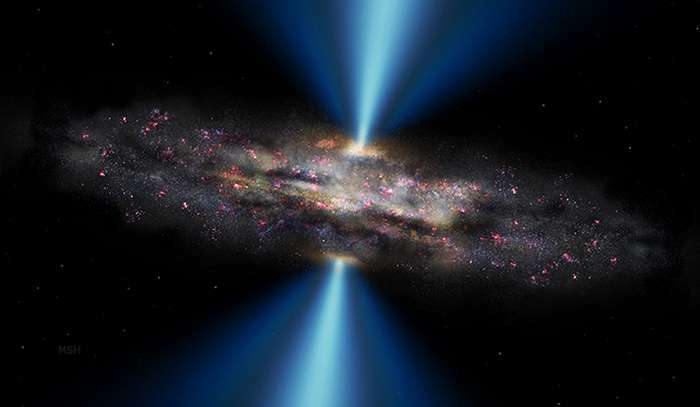 Deep radio imaging by researchers in the University of Cape Town and University of the Western Cape, in South Africa, has revealed that supermassive black holes in a region of the distant universe are all spinning out radio jets in the same direction. 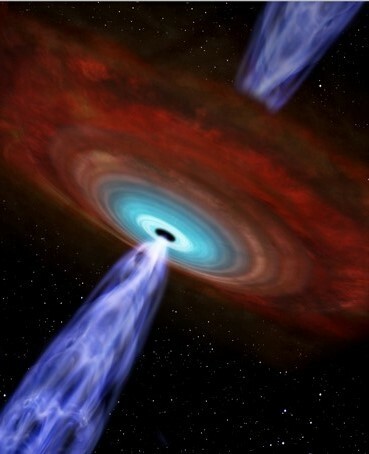 The astronomers publish their results to the Royal Astronomical Society. 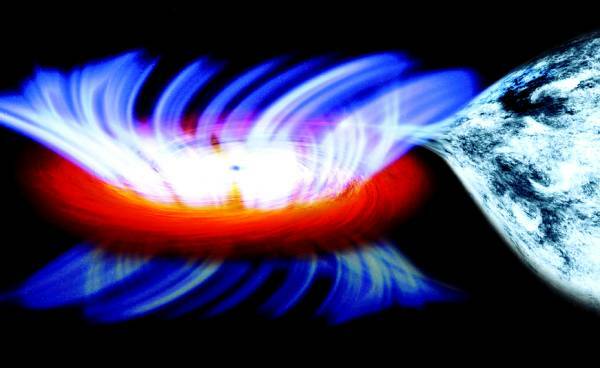 The jets are produced by the supermassive black holes at the center of these galaxies, and the only way for this alignment to exist is if supermassive black holes are all spinning in the same direction, says Prof Andrew Russ Taylor, joint UWC/UCT SKA Chair, Director of the recently-launched Inter-University Institute for Data Intensive Astronomy, and principal author of the Monthly Notices study. 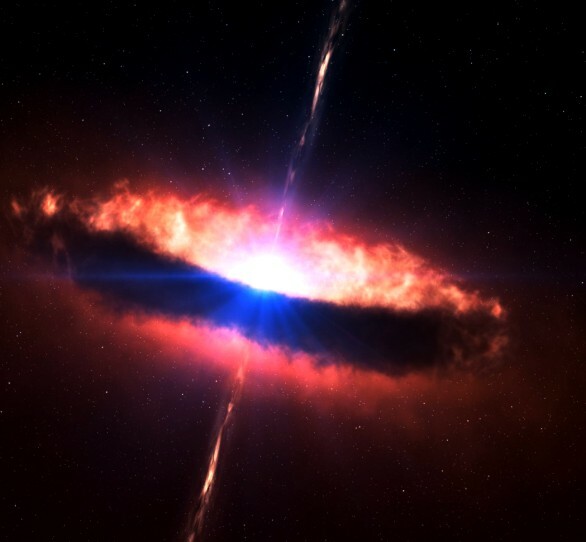 So what could these large-scale environmental influences during galaxy formation or evolution have been? 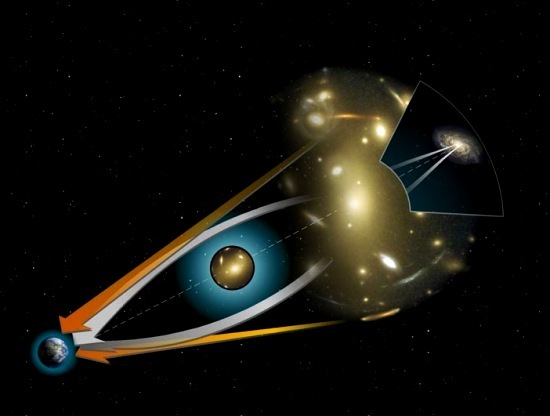 There are several options: cosmic magnetic fields; fields associated with exotic particles (axions); and cosmic strings are only some of the possible candidates that could create an alignment in galaxies even on scales larger than galaxy clusters. It’s a mystery, and it’s going to take a while for technology and theory alike to catch up. 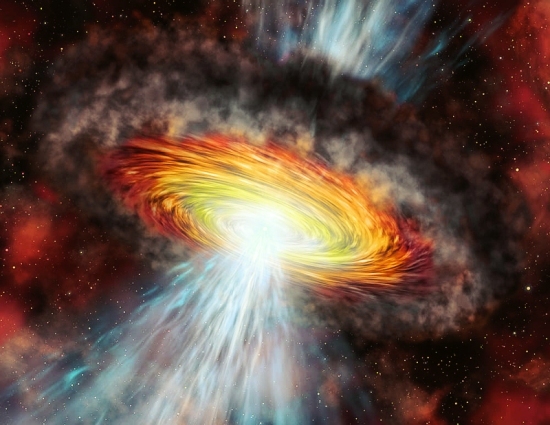 The finding wasn’t planned for: the initial investigation was to explore the faintest radio sources in the universe, using the best available telescopes – a first view into the kind of universe that will be revealed by the South African MeerKAT radio telescope and the Square Kilometer Array (SKA), the world’s most powerful radio telescope and one of the biggest scientific instruments ever devised.